Just a quick note to let everyone know I have uploaded all of Cousin Mike’s research for you to look at and enjoy. 1. Click on the Document Gallery tab at the top of the page. 2. Select Wise Guys from the list of options. 3. After you select Wise Guys, a new page opens (see above.) 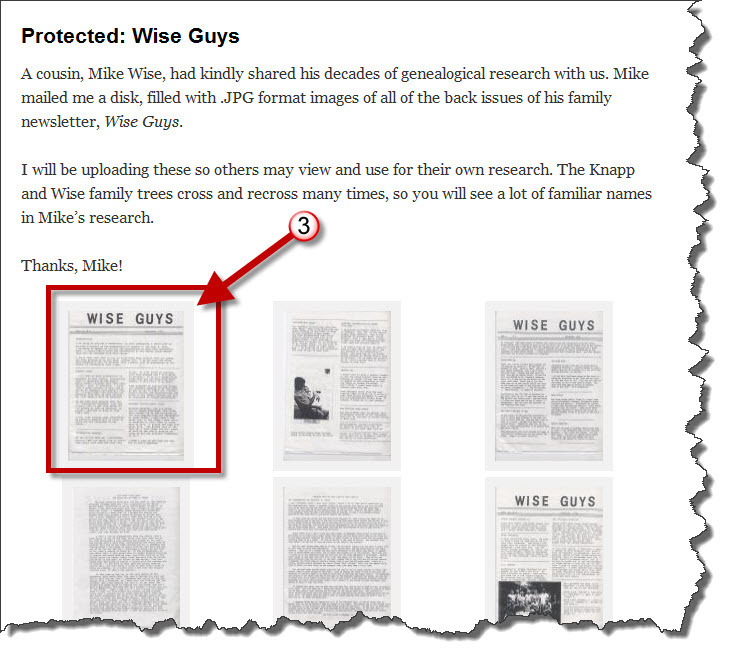 Click the “thumbnail” image of the issue of Wise Guys you wish to review. 4. A full page version of the newsletter will open. Note: You should see some arrows <> on either side of the image. Click on these to move forward or backward through all of the pages. I have also typed out one of the stories and placed it under the Stories section. I will post more later. Eventually, I hope to make these into searchable PDF files. But in the meantime, enjoy browsing through this great information. p.s. This section is password-protected for security reasons. Also: to exit the photo gallery, press the ESC key (ESCAPE). 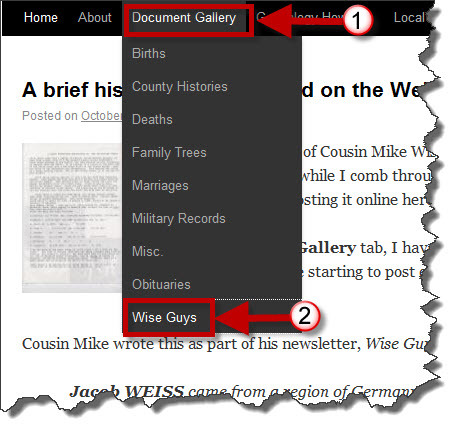 This entry was posted in Family History, Knapp Notes Changes, Stories, Weiss, Wise and tagged Weiss, Wise, Wise Guys. Bookmark the permalink. I am not sure I have a password to get on the Wise page. If I do I have no idea what it is. If I am receiving your Knapp notes did I get a password then? Please email me back when you are able.